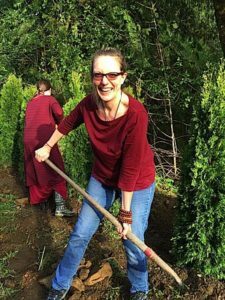 Lama Dr. Shannon Young — Dzogchen Lineage teacher, Doctor of Pharmacy, and loving wife and mother — advocates bringing “Dharma” into daily life. “My teacher has always said that the Pharmacy is my retreat cave,” she explains, referring to her “day job” as a Pharmacist. 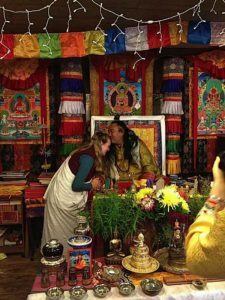 Lama Young is one of the rising new teachers who blend precious lineage tradition with modern Western culture. BW: Your teacher Dzogchen Khenpo Choga Rinpoche encouraged you to become a teacher, in part because he believes it’s beneficial to students to receive teachings from people of their own culture. What has been your experience with this? SRY: I think his approach is beyond brilliant because it is integrating both the timeless wisdom of a lineage with a unique cultural awareness. We must adapt to a culture while maintaining the realized, wisdom tradition. Ultimately we should be reaching for realized western teachers in the west. 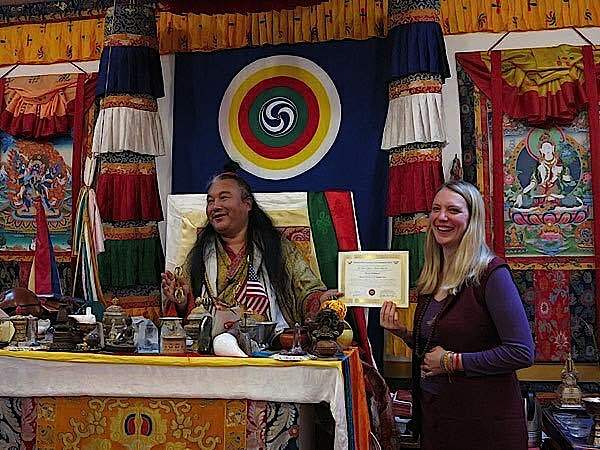 Lama Dr. Shannon Young (right) with her teacher Dzogchen Khenpo Choga Rinpoche. 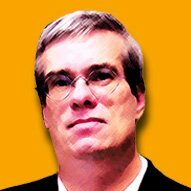 BW: What are some of the differences in receiving teachings from a traditional Rinpoche from Tibet versus a teacher born, raised and authorized in the West? 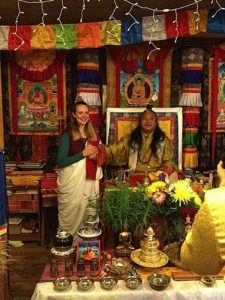 Dzogchen Khenpo Choga Rinpoche (right) with his student Lama Dr. Shannon Young. 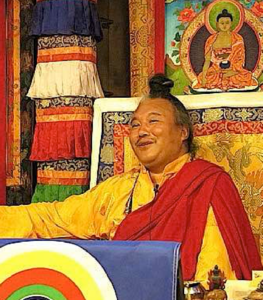 Khenpo Choga Rinpoche advocates and encourages Western teachers for Western pupils. SRY: I think it has to do with having similar frameworks and references. Of course a realized master is going to have the breadth and depth that even an authorized western teacher won’t. At the same time, having a teacher with a similar background can help bridge the gaps in assimilating the dharma. 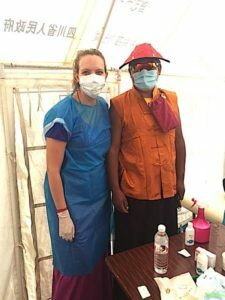 BW: You are both a Doctor of Pharmacy and a Dharma Teacher? Do you find you bring your practice into your work? SRY: My teacher has always said that the Pharmacy is my retreat cave. He said that for the Dharma to really survive it must work within the daily realities of its practitioners. So in my work I must bring love, compassion, and wisdom into every moment of thinking and acting. It actually brings a level of meaning to every task. Of course being in a field where you contact humans and their suffering its very powerful. BW: Where do you teach? 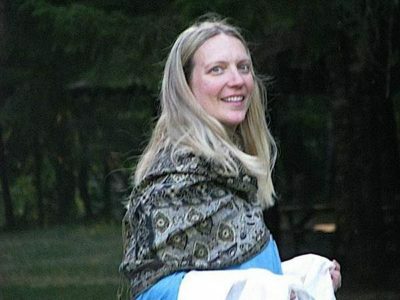 Lama Shannon Young at a retreat with the prayer flags. SRY: I usually teach in local Dharma centers. Recently I led a weeklong retreat in Hawaii. BW: How did you meet your teacher originally? SRY: I met him in Boise, Idaho in 2003 during one of his teaching tours. BW: From your teaching topics, you seem to teach a form of “bringing the Dharma into daily life.” For example, “healthy lifestyle.” Can you elaborate on that a little? SRY: The true health is really centered on having a stable and compassionate mind. We try to promote health based on moderation. 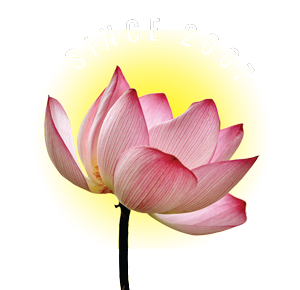 BW: Some of your teaching topics, such as non-waste economic system and free university education have a feeling of “cause”-oriented teaching: that is, right living, right livelihood and other Buddhist teachings brought into modern context. 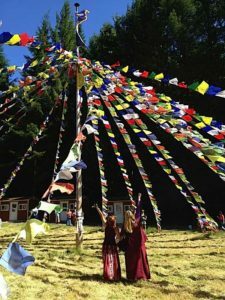 Do you advocate Dharma activity outside of the practice hall in support of causes such as non-waste economy? (Which lately has been described as “Ecodharma”). SRY: I think loving, compassionate, and wise people should also bring that into other spheres, such as public policy. But we shouldn’t force our views on others through that policy. We should help inform and elevate the debate. It’s important to be aware that we don’t become too rigid and controlling in trying to force ideologies together. The dharma should be inclusive and not serve short term political agendas. BW: Can you elaborate on “non-waste” economic system as a teaching topic? SRY: It’s really about intention and having an inclusive long-term perspective. So much of our system is based on driving up consumption and many of our products are needlessly disposable. But it doesn’t stop there. So it’s looking at the thinking that drives this culture and transcending with one that isn’t about short-term gains at the expense of future generations. BW: Do you bring technology into your teachings? For example, do you blog, use social media (in a Dharma context), use computers in the meditation hall? Lama Shannon Young (left) with Rigzin Tarchen Rinpoche (right) working on One Path Outreach. SRY: We are openly embracing platforms that can make the teachings more accessible. We use computers during teachings for taking notes and we also livestream many of our teachings and even use Skype for group teachings. BW: What do you mean by “healthy lifestyle” as a teaching topic and what do you cover? SRY: Beyond the obvious areas of plant-based diets, we also talk to the idea of “joyful moderation” which means that we don’t get to strict with certain restrictions—knowing when to have that piece of cake and not feel guilty about it. But the heart of being healthy is valuing this precious human life and taking care of ourselves in order to benefit all beings. BW: We spoke about the Female Enlightened and women teachers in our last interview (story here>>). Do you find you teach differently to a group of female students, versus a mixed group? SRY: You could say that the audience does influence the type of teaching, but we try to really focus on the mind and how we can transform our thinking. Of course a large group of one type of audience can influence the discussion, but we are ultimately trying to recognize our true nature. 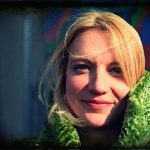 BW: What is the one thing you hope people will take away from your teaching sessions? SRY: That we are the heroes of our own lives. We can liberate ourselves from suffering and become Buddha in one life. Lama Dr. Shannon Young greets her teacher Dzogchen Khenpo Choga Rinpoche. Lama Dr. Shannon Young advocates and teaches bringing Dharma into every day life. Great Perfection of Wisdom lineage holder Dzogchen Khenpo Choga Rinpoche was born in Tibet, where he began training in Buddhism at the age of five at the Dzogchen Monastery. 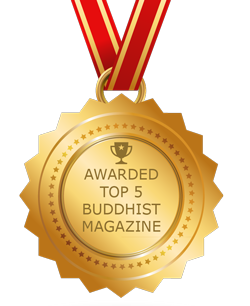 He has been recognized as the reincarnation of enlightened Tibetan master Gedun Chopel, who is the emanation of Manjushri, the Bodhisattva of the Buddha’s Wisdom. He received the transmissions and teachings of the Sutras, Tantras and Shastras from forty-two Buddhist masters and the complete empowerments and instruction of the Dzogchen Tantras from his root masters Khenchen Padma Tsewang, Drupchen Chatral Chochyab, and Guru Dechen Namdrol. He studied and taught for ten years at the Dzogchen Shri Singha Five Sciences University the five major sciences of Fine Arts, Medicine, Linguistics, Philosophy, and Buddhism, as well as the five minor sciences of Poetics, Synonymy, Prosody, Drama, and Astrology. For seven years he meditated in the Siltrom Mountain caves in the Holy Dzogchen area of Tibet, under difficult conditions, with little food and only a few tattered clothes. During that time, he recited millions of mantras and was directly granted the blessings of Buddha Shakyamuni, Padmasambhava, Shri Singha, Bodhisattva Manjushri, Avalokiteshvara and Tara. Continuously he studies and practices with diligence, as well as being patient, disciplined, and generous to others. He is always radiating wonderful blessings and healing powers of wisdom to all beings and all elements. Rinpoche is the thirty-third holder of the Dzogchen lineage, lama of Dzogchen Monastery, a Professor of the Dzogchen Shri Singha University, Spiritual Leader of Dzogchen Shri Singha International, Founder of the Dzogchen Shri Singha Dharma Centers, and Director of Dzogchen Shri Singha International Charitable Organizations. He has written more than thirty books on the five major sciences. He currently teaches Dharma and gives practice training to thousands of students, in more than forty countries around the world.